Bitcoin, Ethereum and cryptocurrency in real estate transactions are increasing across the U.S. and Florida was one of the first major examples of this trend. Title Partners of South Florida has closed several Bitcoin real estate transactions and we’re seeing more and more real estate being purchased, listed and sold with Bitcoin, Ethereum and other cryptocurrency as they become more popular and socially acceptable. Would you like to accept Bitcoin, Ethereum or other cryptocurrency for your real estate sale or use them for the purchase of real estate in Florida? Give us a call at (954) 566-6000 to discuss your options. The real estate industry is changing dramatically as new technologies and services influence the way society completes real estate transactions. One of the emerging technologies of the last decade is cryptocurrency. The growing popularity of cryptocurrencies like Bitcoin and Ethereum has enabled some individuals to sell or buy a house with cryptocurrency as the sole medium of exchange. Buying a home with cryptocurrency like Bitcoin is becoming more common. In fact, some believe that cryptocurrency will revolutionize the future of real estate transactions. 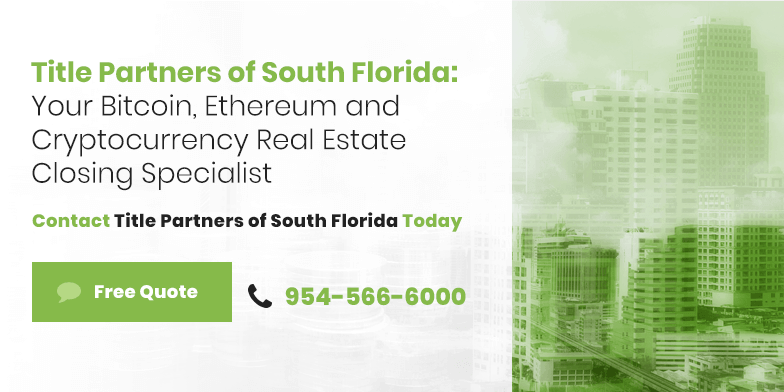 Title Partners of South Florida understands the significance of Bitcoin, Ethereum and other cryptocurrencies in the real estate industry. As this type of transaction becomes a more popular and accepted option for homebuyers and sellers, those who wish to use cryptocurrency will require unique services to complete their real estate transactions. It’s important not only to understand how these transactions work but also to ensure title insurance and closing needs are met by processing and closing these transactions safely and securely. No matter which form of currency you use, you should approach every real estate transaction with the knowledge and understanding you need to complete the sale accurately and efficiently. Over 20 years of experience in the real estate industry has enabled us to become experts in the title and closing processes. As one of the first title companies ever to assist in closing a cryptocurrency real estate transaction in Florida, we consider ourselves trailblazers and have assembled some important information on closing cryptocurrency transactions on this page. 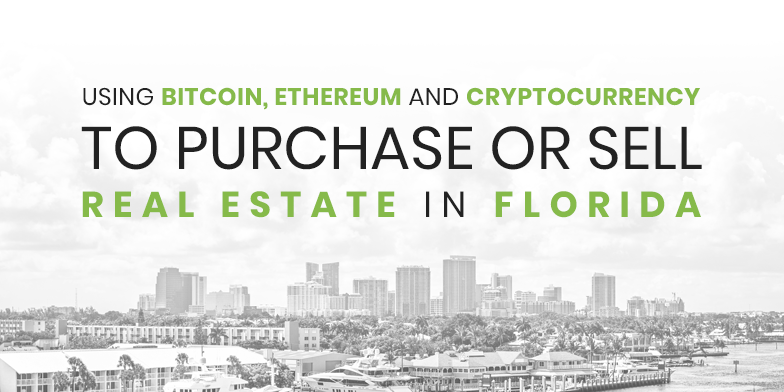 Read on for important insights in regards to buying or selling real estate with cryptocurrencies in Florida. A cryptocurrency is a form of money that is digital. There are two significant ways in which it differentiates from other forms of currency. First, cryptocurrencies are purely virtual, which means that they do not exist as a physical bill or coin. Second, most cryptocurrencies are decentralized, which means they are is not issued from a central bank. This allows people to exchange cryptocurrency without involving financial institutions. There are over 2000 cryptocurrencies in use today according to coinmarketcap.com, the most popular cryptocurrency ranking site. Bitcoin is known as the first and most stable decentralized cryptocurrency in the world. As this currency is exchanged between parties, a block of information is added to a publicly viewable chain of data that keeps a record of all transactions made via blockchain technology. Ethereum is another form of cryptocurrency that uses smart contracts to complete transactions. For instance, a smart contract will state that when a consumer pays the supplier a set amount of Ether tokens, the supplier will provide the consumer with a product or service. These transactions are also public. Though cryptocurrency is a relatively new method of completing transactions, many forms of cryptocurrency are gaining support from large corporations. Today, more than 100,000 merchants worldwide accept this digital currency as a form of payment for products and services, including well-known companies like Virgin Airlines, Microsoft and WordPress. NASDAQ has also announced plans to allow Bitcoin futures to be traded on its electronic exchange. Joining this list is Title Partners of South Florida, which has created proven processes and procedures for accepting Bitcoin, Ethereum and other cryptocurrency to buy or sell real estate in Florida. How Are Bitcoin, Ethereum and Other Types of Cryptocurrency Used to Purchase Real Estate? Bitcoin and other popular cryptocurrencies like Ethereum are being used to purchase real estate all over the world. From home services to purchases and sales, the industry is exploring various ways to use cryptocurrencies. Property buyers are now paying with cryptocurrencies while sellers have the option to accept the digital currencies directly or have them converted into USD. The power, openness and security of the blockchain are also being explored by industry stakeholders as a viable option for recording property titles and transfers during the sales process. Are Bitcoin, Ethereum and Other Cryptocurrency Commonly Used for Real Estate Transactions? The use of Bitcoin, Ethereum and other popular cryptocurrencies is attracting more attention, and more buyers are now using it to purchase properties in place of cash, particularly those who are cryptocurrency investors. However, the use of Bitcoin, Ethereum and other cryptocurrencies by title companies and other vendors involved in a real estate transaction is still very uncommon. In fact, very few title companies have the experience and understanding of how cryptocurrencies work. Therefore, they’re not always able to handle the intricacies of a cryptocurrency transaction or simply guide the parties involved through the process. This is why it’s important to work with a title company such as Title Partners of South Florida that is familiar with and has actually closed cryptocurrency transactions. Why Is Bitcoin the Most Popular for Real Estate Transactions? As a peer-to-peer electronic monetary system without a central regulatory body, Bitcoin has become the most popular cryptocurrency. It grew in popularity and its value rose from $0.003 in 2010 to almost $20,000 with a market cap of over $330 billion in December 2017. Due to its wide acceptance, the currency has seen many states craft legislation for tax purposes and refer to it as a digital property or a commodity. Unfortunately, this means you’ll need to pay capital gains tax when your property is sold through a Bitcoin real estate transaction. We at Title Partners of South Florida strongly suggest you consult with your CPA or accountant prior to buying or selling real estate with Bitcoin, Ethereum or any other cryptocurrency. All Bitcoin transactions are encrypted. To initiate a real estate transaction with Bitcoin, you need to have a digital wallet. You can typically fund it with PayPal or your credit card through a mainstream Bitcoin broker. However, some banks and credit card companies have banned their users from making transactions using cryptocurrencies like Bitcoin. There is much speculation as to why this may be happening, including possible concerns from banks about liability and disruption in their industry. Before choosing to fund a digital wallet, be sure to check with your financial institutions to ensure all financial transactions will go smoothly. Regardless of whether you are buying or selling a home using fiat currency or if a cryptocurrency like Bitcoin or Ethereum is an acceptable form of payment, you should begin every real estate transaction armed with the knowledge and understanding you need about the home buying or selling process. Speak with a real estate agent, financial advisor or other professional to be as educated as possible. You may also call Ryan Phillips, V.P. at Title Partners of South Florida at (954) 566-6000 to discuss the title and closing processes, as well as how to complete real estate transactions with cryptocurrency. He is quickly becoming a leading authority when it comes to closing a real estate transaction in Florida with cryptocurrencies. Title Partners of South Florida’s mission is to provide you with a professional, engaging and memorable experience when closing any real estate transaction. We’re happy to answer any questions you may have to help you gain full confidence in completing a safe and secure real estate transaction using cryptocurrency. Option 1: A buyer can send cryptocurrency directly to the seller. Instead of writing a check or moving cash between financial institutions, the parties exchange cryptocurrencies between their own digital wallets. Buyer and seller assume additional risk and liability. Seller never delivers deed to buyer or Seller delivers deed, but never receives payment. Vendors such as the county, state, banks, real estate brokers, etc. do not accept cryptocurrencies as a form of payment – how are they paid and who pays them? Who prepares the documents to transfer title and comply with Florida Statues and title standards? Buyer is not able to obtain title insurance per s. 690-186.08 of the Florida administrative code, so Buyer assumes liens and/or encumbrances against property, as well as any potential title defects. Option 2: The other and more viable option is for the Buyer and Seller to work with Title Partners of South Florida to address the pitfalls above through proven processes and procedures to facilitate a smooth and stress free closing. When deciding whether to accept cryptocurrency as payment for a property or if you’re considering using or exchanging cryptocurrency for the purposes of a real estate purchase, we suggest you ask your financial advisor for guidance. As with any large investment, it’s wise to seek professional consultation on the most effective way to manage the financial aspects of a sale. Another advantage in using cryptocurrency to purchase or sell a home is that the transaction can be completed and the closing on the property can be finalized in less time than a traditional real estate sale funded by a bank. By working with a title company like Title Partners of South Florida, all legal and municipal issues can be taken care of within days to expedite the transaction without having to wait for weeks or months for funds to be exchanged. Cryptocurrency and real estate transactions are quickly becoming more common as buyers and sellers responsibly take advantage of this safe, secure and swift finance option. Some believe Bitcoin, Ethereum and other types of cryptocurrency and real estate are a powerful combination that will shape the industry for years to come. Bitcoin and cryptocurrency like Ethereum will continue to show promise in the real estate industry. Purchasing real estate with cryptocurrency has the potential to reduce the time required to close a transaction. Also, cryptocurrencies like Ethereum allow for smart contracts, which may one day improve the security, transparency and efficiency of a real estate transaction. Most sellers would prefer buyers who can provide secure funds within a short period of time. Title Partners of South Florida offers a unique service for Bitcoin, Ethereum and other cryptocurrency real estate transactions. Our team is trailblazing the processing and closing of real estate transactions involving cryptocurrencies, and we have successfully closed real estate transactions involving cryptocurrency. Unlike most title companies that don’t have experience handling transactions with cryptocurrencies or navigating the complexities of a cryptocurrency transaction, Title Partners of South Florida has the expertise necessary to help you navigate and close a cryptocurrency real estate transaction successfully and stress free. For more information on best practices for using Bitcoin, Ethereum and other cryptocurrency in real estate transactions, contact us today. If you’re interested in partnering with us for title insurance and closing needs, visit our online quote page or give us a call at (954) 566-6000. In 2014, a fully managed villa in Bali, Indonesia, sold for more than $500,000 in Bitcoin. The property located at the DelMango Villa Estate is listed at 3,000 square feet as a two-bedroom, two-bathroom home. In 2017, a $24 million London mansion was put up for sale in the Notting Hill District, and the seller stated they’d only accept Bitcoin to purchase the property. In 2017, a man in the Netherlands sold his home, along with all of his possessions, for Bitcoin. In 2017, a homeowner in Melbourne, Australia, listed his five-bedroom house for sale and agreed to accept Bitcoin as partial payment. In 2017, a married couple placed their Sovereign Islands home on Australia’s Gold Coast for sale for an estimated $6 million listing in Bitcoin. In 2018, a family placed their Vancouver home up for sale for $2.7 million and would consider accepting Bitcoin as payment. In 2018, a Toronto man listed his property in Ontario, Canada, for an estimated $450,000 in Bitcoin. In 2018, three luxury apartments in Budva, a coastal town in Montenegro, were sold for a total of $3.2 million using Bitcoin as the form of payment. In 2018, a palazzo in Malta was listed at $3 million and the owner of the property included in the listing that he would only accept Bitcoin as the form of payment. In 2018, the largest real estate developer in Ireland began accepting Bitcoin as payment for purchasing its property. In 2018, the Aston Plaza & Residences in Dubai reported selling at least 50 apartments for Bitcoin. In 2018, Richard Hilton placed a mansion up for auction using a cryptocurrency real estate auction. The chairman of Hilton & Hyland listed this Rome property at a starting bid of $40 million in cryptocurrency. Hundreds of properties are being listed online that accept Bitcoin or other forms of cryptocurrency as payment. This trend is spreading throughout the United States as private sellers and corporations list their properties for sale with cryptocurrency as an acceptable form of payment. In 2014, a 1.4-acre home in North Lake Tahoe sold for $1.6 million in Bitcoin. Located in Martis Camp, which is labeled as a premier luxury real estate community, this property also includes access to the gated communities’ amenities which include a movie theatre, bowling alley, outdoor amphitheater and an 18-hole golf course designed by renowned architect Tom Fazio. In the summer of 2017, Bitcoin was used for the first time in Texas as the sole currency to purchase a home. This custom-built home in Austin housed luxurious features like a stylish entertaining area, spectacular kitchen, elaborate master bedroom and bathroom and a beautiful backyard. In 2018, two condominiums located on the Upper East Side of New York City were purchased using Bitcoin. The studio was sold for $875,000 worth of Bitcoin and the one-bedroom condo was sold for $1.48 million worth of Bitcoin. Bitcoin, Ethereum and cryptocurrency in real estate transactions are increasing across the United States, and Florida was one of the first major examples of this trend. The use of Bitcoin is becoming more frequent in the Sunshine State as more South Florida real estate listings feature the cryptocurrency as an optional form of payment. In 2017, a Bitcoin enthusiast sold their house in Miami and completed a successful Bitcoin real estate transaction. In early 2018, a Miami townhouse was closed on for a price of $338,878 to be paid completely in Bitcoin. In 2018, a West Palm Beach home was listed with an option for buyers to use Bitcoin, Ethereum or Litecoin as payment. Would you like to accept Bitcoin, Ethereum or other cryptocurrencies for your real estate sale or use them for the purchase of real estate in Florida? Give us a call at (954) 566-6000 to discuss your options.